Experts advise that at least half the grains we consume should be whole grains. But what is a “whole” grain, and why is it important? A grain consists of 3 parts: the germ, endosperm, and bran. The grain may be mechanically processed, but for a grain to qualify as “whole”, all three parts must be present. When you read a food label and it has a “Whole Grain” stamp, this means that it contains at least 8 grams of whole grain per serving, and at least 51% of the grain is whole. If the product has a “100% Whole Grain” stamp, this means that it contains at least 16 grams of whole grain per serving, and ALL the grain is whole. Think that grains are just a form of carbohydrate? 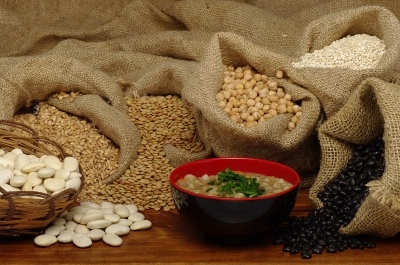 Think again – whole grains are an excellent source of fiber, carbohydrates, AND protein. Consuming whole grains can also help maintain weight and can reduce the risk of stroke, heart disease, and type II diabetes. When grains are kept intact, they also retain their nutrients, such as magnesium, phosphorus, zinc, and B-complex vitamins; many of which are found in rich supply in grains. Adults should aim for an average of 3-6 servings of whole grains per day. For Example, 1 serving = ½ cup cooked grain or 1 ounce of uncooked grain or 1 slice of 100% whole grain bread or 1 cup of 100% whole grain cereal. Also – try to remember: Whole Grain & Multi Grain do not mean the same thing. Look for Whole Grain or 100% Whole Grain if you are trying to pack a nutritious punch. For those of you with gluten sensitivities, common gluten-containing grains are: wheat (and different wheat varieties), barley, rye, and triticale. And gluten-free grains include: amaranth, buckwheat, corn, millet, quinoa, sorghum, teff, rice, and wild rice. One of my favorite gluten-free grains is quinoa – it has the highest protein content of any of the whole grains, it cooks quickly and tastes delicious. Our family loves this recipe for Seriously Yummy Quinoa Salad and we’ve also found a keeper with this recipe for Veggie Burgers with Black Beans & Quinoa.